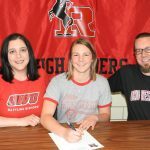 Congratulations to Rough Rider Hannah Face as she has signed a letter of intent to attend Ohio Wesleyan University in the fall and to play field hockey for the Battling Bishops. Hannah has been an excellent student/athlete at RHS who excelled in field hockey, basketball and band for the Rough Riders. Congratulations Hannah! Wednesday, February 15, 2017 7:30 PM Kent Roosevelt High School AWAY 48 Highland High School HOME 51 Game Recap In a great showing, Kayla Fischer scored 24 points, but this was not enough as Roosevelt fell to Highland 51-48. On a two-pointer from Emily Lyon, Highland (Medina, OH) clinched their win in the fourth quarter.